The 'Indian Spiderman' has overseen a lot of changes and his strong words on the Indian National Team manager Stephen Constantine will be hard to ignore. As a Player who has represented the National Team for over a decade, how important is the match against Macau? For a player every match is important but there are some matches which stay a bit more significant. The match against Macau is one such one. We all know that a result in the match will take us nearer to a coveted berth in the AFC Asian Cup UAE 2019. In Indian Footballing history, the match has an added value, just like the World Cup Qualifier play-off against Nepal in March 2015. Had we lost that one, we would have sat idle for the next 4 years. How much is the Team prepared for the challenge? We are unbeaten in the last 10 matches, having won 9 of them (including the unofficial match against Bhutan). The boys are confident and the body language is very positive. A team is always judged by its ability to sustain the momentum and at present, we have worked hard to retain the winning streak. The rhythm defines the squad. The two practice matches could not have come at a better time. How do you rate Stephen Constantine as a Coach? He has been in charge for almost 30 months now and if you look back at the journey, as far as FIFA Rankings are concerned he has delivered what no other Coach in India has been able to achieve so far. No coach has been able to make us win 9 on the trot; no coach has been able to take us from 173 to 96 in the FIFA Rankings. And none happened by fluke. HERE! Mark your dates for the FIFA U-17 World Cup! You can never win 9 at a stretch by fluke; you can never jump 77 places in FIFA Rankings by fluke. We have achieved all of that under Constantine. Even as I need to mention the efforts put in by all the support staff, the coach will always get the lion’s share of the credit; and rightly. Moreover, he has debuted 35 youngsters so far, many of whom will hold the fort for the National Team for the next few years. In that sense, he has already created the supply line. He has brought in a revolution, a total change in Indian Football. You have been part of many an Indian squad since 2007. What is the specialty of this present squad? The Indian National squad has always been a talented one. But this time we have a much younger squad, the average age is much lesser. 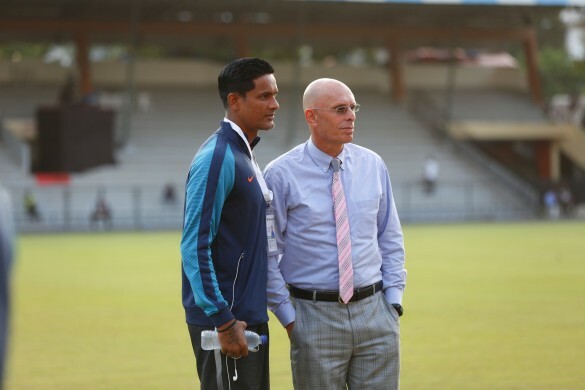 Given the fact that the nucleus of the squad has been with coach Stephen Constantine for the last two and half years (since March 2015 when he took over the team in his second stint), the coach has been able to instil a sense of self belief and prepare them mentally and physically to deliver what he wants them to. I would say mentally the present squad is very strong, the work rate is very high and the fighting spirit stays very distinct. We never give up till the final whistle. You have starred in an Asian Cup where you were nicknamed the ‘Spiderman?’ What is the significance of the Asian Cup? It’s hard to explain till one actually plays in it. Even before I landed in Doha in 2011, I wasn’t aware of its magnitude, the atmosphere. It is one of the biggest Championships in the World, it’s the Continental Championship. As a player, it’s a dream to play there and we cannot take our foot off the pedal at the moment.